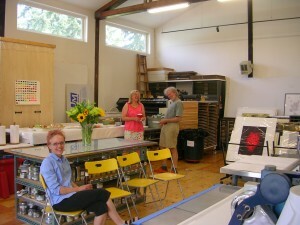 Yesterday I stopped by an Open Studio reception for Artist Kristina Hagman at Sideral Press in Tukwila. I have written about Kristina and her Art several times on the DANIEL SMITH Blog and her “36 Views of Mt Rainier“. 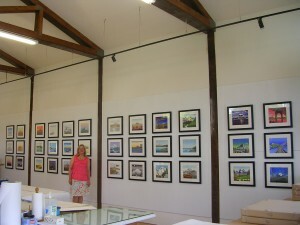 I was excited to see her work again, and for the first time, ALL 36 prints were hanging on a single wall. It is striking to see the prints all together…just awesome like Mt Rainier itself as you look up to see the prints laid out 3 high and 12 across. Sidereal Press is in a renovated “barn” and is a gorgeous space where owner Sheila Coppola works with artists hand printing the artwork on some amazing presses. Sheila and Kristina showed me the cool old press (I think I was told it was a newspaper letterpress) that they pulled Kristina’s’ prints from. They gave me a little demo to show me how it worked, which was fascinating. Thank you Kristina and Sheila! Kristina is also currently showing some of her work at the Kirkland Arts Center as part of the Seattle Print Arts’ ten-year anniversary celebration. 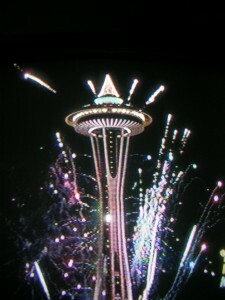 The show: “TEN: Seattle Print Arts 2010 Anniversary Exhibition“ is on now through June 5th. 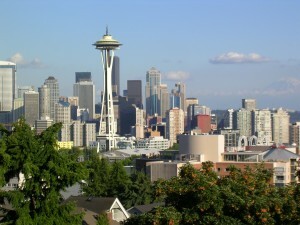 Seattle’s’ Urban Villages blog is experiencing a renaissance…. May 15th, 2010 Categories: DANIEL SMITH: Artists' Materials, Welcome to my Blog! 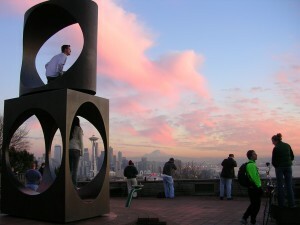 After having “disappeared” for a while, I am re-inspired to begin blogging again here at Seattle’s Urban Villages. I have been actively blogging for DANIEL SMITH Artist’s Materials on the DanielSmithBlog (over 2 years & 267 posts so far!) and have been their Social Media (Facebook & Twitter) Specialist since late last June which has kept me busy while I was on what turned out to be, a real estate hiatus. For a number of reasons, I was not feeling very engaged with real estate (the blog, & other things) and this hiatus had been beneficial for me to re-energize and re-connect for this renaissance. It’s actually feeling very exciting to step back into the Real Estate Market (the blog, & other things) again. I have re-thought my purpose, and this gestational period has allowed me to grow in many ways that will benefit my clients, friends, family, and myself. There is a lot for me to write about here on the blog, about Seattle Real Estate and Seattle’s Urban Villages, Art will be featured, AND I have a lot to say about a wide range of topics as well. 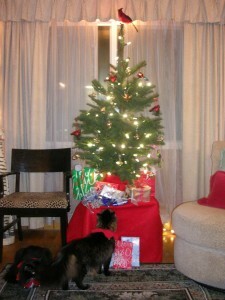 January 1st, 2010 Categories: Holiday Fun, Just for Fun! Wishing everyone a successful, creative, and Happy New Year! While driving yesterday morning to my monthly meeting at my Realty Executives – BRIO office in Bellevue, I was thinking about all the recent activity I have been seeing in the Seattle real estate market via my client searches on the NWMLS. I have been seeing an increase in homes going pending, and then actually closing. I saw two earlier today, and one was a property one of my clients made an offer on last month. Unfortunately there were 3 other competing offers, and my client’s was not the winning one since (I think) he wanted an extended closing date. The First Time Home Buyer Tax Credit is now in effect through late December. This helps stimulate the “Move-up” home buyers chain reaction. The first time Seattle home buyers can now buy a house, that means the sellers of that house are now free to buy another, usually larger house and so on. There are still many, really good programs to help first time home buyers buy their first home. The interest rates are very low. While the rates are low, there are stricter guidelines to be met to obtain them such as more money down, and higher credit scores. However, these are really just returning to prudent lending practices that were in place long before the recent free wheeling credit spree. Jumbo loans are becoming more available and with better rates. Jumbo loans started becoming harder to get, and almost impossible at first, when the Jumbo Loan contraction happened happened in August 2007. We are only just now starting to see improvement for home buyers needing Jumbo loans, which in the Seattle real estate market means a large percent of the Seattle home buyers. There seems to be a faint sense of returning confidence in the stock market and recent news services have been reporting an improving level of optimism in the country. So, there you have it, I think we have seen the low point in the Seattle real estate market in March, at least for the urban/metro areas. The outer areas will still take some time. The closer in Seattle neighborhoods are more resilient to real estate market downturns because of their central, higher demand locations so they will be the first to recover as home buyers realize that there are homes out there that they can now afford…in some cases really good deals, at least for a while! Happy Easter! Peeps to Entertain You! It’s that time of the year again when the Seattle Times holds its’ Peeps Contest! There was even one submission that was on YouTube that was a Jackson Pollock Peep Action Painting. 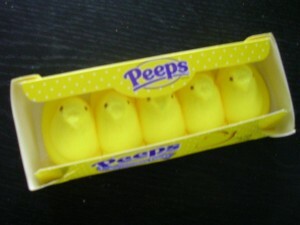 The Seattle Times reported that they received nearly 150 submissions and they selected their Top Ten Peeps. Have some Easter Fun checking them out! Those Marshmallow Peeps that look so innocuous are taking over the world in National Geographic Traveler with their contest “Peeps in Places ” Photo Chalenge. The challenge is so big, it isn’t ending until the day AFTER Easter! So what do Peeps have to do with Seattle Real Estate? Nada, not a peep! But you know, I suppose “Peep-ole” do need to live somewhere…. My Top 10 Picks of the Most Important Things Every Seattle Home Buyer Should Know based on HGTV’s “House Hunters” Top 25. Sunday night HGTV ran a special based on their “House Hunter ” TV series which now has over 600 episodes, called “House Hunter’s Guide to the Top 25 Most Important Things Every Potential Home Buyer Should Know “. So I thought I would watch and pass along my top 10 picks from the 25 for you, and add my thoughts as well. There were a lot of good, common sense suggestions in HGTV’s tips, though I thought there were too many to try and stretch out the tips to 25, and fill an hour long program. Space, and the *yawn* factor to include all 25 of the tips is going to limit me to posting just my Top 10 picks from the 25. If you would like to see all 25, just drop me an email an I will send them along to you since HGTV does not have them listed on their site. #25 Know what you want and need: Make a list of you would LIKE and what you need. Needs and wants are different! Wants are extras. #24 Be ready to compromise – you won’t be able to afford everything you want. Your next “Move Up” home will very likely be closer to having more of what you would like. The current one will help you leverage into your next home in 5 or more years depending on the market and if you add value to the home with improvements. Updating/remodeling – don’t forget this cost. It might be things need to be done immediately, or over time. #22 Buy in Winter – There is more inventory in Spring, but better deals in the Winter. This is sooo true! #21 Check out the neighborhood – be sure you do your homework to find out important things about the neighborhood, like the schools (how good they are) possible development, or construction that could block a view etc. There are lots of great online resources to help with this, but don’t forget the importance of walking the neighborhood in the evening and weekend, and chatting with the neighbors. #20 Consider transitional areas – follow the Artists! Artists need cheap space, they move in, then others follow. This is especially true in Seattle, with older artist areas of Belltown, Ballard, Fremont, Georgetown and we all know how those areas had been going up in value and desirability. #18 Understand Land value – that is the price of the land minus the structure = land value Ex: waterfront property, there is only so much available so that value holds better. While Seattle does have lots, and lots of waterfront because of the Sound, the lakes, and canal, it is very desirable, and will always be very desirable…because there is still LESS of it. Same goes for water views, just less expensive than waterfront. #8 Buy the house not the furniture – be sure look past both the bad (dirty homes and dated furnishings) and the good (staged homes) to see the true value for you. YES! You will likely get a better deal if you can look past the wear and tear, and dated things because many buyers will pass on those homes putting downward pressure on the home’s value. The same works in reverse, that is why staging is a valuable selling tool. Be smart, it’s all about the value of what STAYS with the house. #5 Buy the worst house in the best area – a great way to buy an affordable home in a great area. Remember, that it can be time consuming and more costly than you originally thought to fix up. If you are trying to get more for your money location wise, then this is very important. Remember: Location, location, location! This also works in reverse when you buy the BEST home in an area, the other homes pull down the value. #4 Know a cosmetic fixer from a “gut job” – BIG difference in the amount of time and money to fix up. Identifying “good bones” in a property that can be improved. Painting, changing flooring, plumbing fixtures, lighting fixtures, window coverings, appliances etc. all qualify as cosmetic. Floor plan changes (to correct bad flow, or open up house) additions, replacing systems such as electrical, plumbing, heating, foundations, roofs etc. start moving into the “gut job” area, and can really add to costs. #1 Follow your instincts – choosing your home should be equal parts intellectual and emotional. One home buyer told her agent that “buying a home was like buying a wedding dress”. A real estate agent should help you with the intellectual part, but only you can decide on the emotional side. Yes, you will know when houses seem like the right one, and your Seattle real estate agent should be there to think about the practical aspects of whether the house has the value that works for You. Last thing, HGTV says that home buyers see an average of 9 homes before finding the one they purchase…. There You have it…. Happy House Hunting! 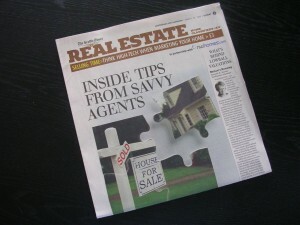 Sunday Seattle Times Real Estate article, March 29, 2009: "Inside Tips From Savvy Agents"
Yesterday, when I saw the title for the Sunday Seattle Times Real Estate section: “Inside Tips From Savvy Agents“. I thought “cool” let’s see what kinds of tips other real estate agents are sharing with their clients….. 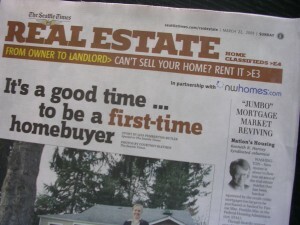 The tips in the article are more like resumes (or advertising) for those agents rather than geared as INSIDE Seattle Real Estate Tips from Savvy Agents for Home Buyers and Sellers. Today, while writing this article, and linking it, I see that the online article now has a different title: “Top Seattle Area Real Estate Agents Share Their Secrets for Sucess”. Which is a better title for the article than the title for the content of the printed article. Be Patient. Take the time to throughly look at what is on the market before you buy, to make sure you choose the best house for You. You are going to live there for a while, and there are no quick turn arounds like in recent years. 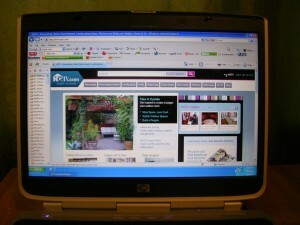 Thankfully the Internet allows easy access to excellent home search sites so you can shop away! Wish I could have done the same when I bought my house is 1997. Don’t pass a on great home (and DEAL) due to poor marketing. One of my pet peeves is the poor marketing done on many short sale and bank owned homes. There are some really great deals out there now right now, if you can find them. Some listings are not noted in the public marketing remarks that they are short sales or bank owned homes, so that can be a challenge. Many of these end up being passed over, and languish on the market because of the listing agents half-hearted marketing photos and marketing remarks. Also, be sure your real estate agent is willing to look into the past sales history of the house, and send you those listings too, since those can have valuable information, as well as much better photos. Your agent should include their insight on what that can mean to you. Don’t become complacent. When you do find THE house, don’t allow yourself to become complacent and think you can ask for the world….especially if it’s already a DEAL. You will likely miss out to another buyer who recognizes the DEAL and acts swiftly with a stronger offer. Mark, At Marks’ Expert Auto, Makes a “Miracle” Happen for My Bianca-saur! I have an older SUV, a Ford Explorer, AND I have a wonderful Auto Repair shop that takes care of my hardworking Explorer…Marks’ Expert Auto. THIS, I needed to think about…. Later when I called Mark back, I said well, lets just do an oil change for now, and I’ll pick her up afterwards. Later, I get a VM from Lisa telling me that Mark made a “Miracle”… Bianca-saur was running better! When I picked her up, she was running sooo much better, not exactly purring, but without the recent “bronchitis” straining. Yay! Lisa did not know what Mark had done, and I only know that something wonderful had happened. You don’t question the nature of a miracle, you just have faith! 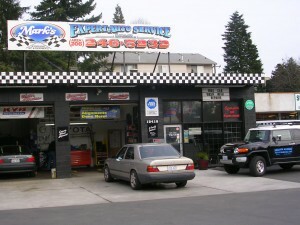 I have been taking my cars to Marks’ for a least a decade, I even followed when Mark moved his shop to Burien. You know, it’s so important to have a trusted auto mechanic. TRUST is an important asspect in all professional service realtionships: Trusted Accountant, Trusted Auto Repair, Trusted Electrician, Trusted Plumber, and…ahem, Trusted Seattle Real Estate Agent! Thanks Mark, Lisa and let’s not forget Nate!